How to convert AVCHD M2TS MKV MPEG WMV FLV AVI to iPad iPod iPhone Apple TV on Mac OS X? How to download and convert Website online video, such as YouTube video? Can this HD video converter transfer HD video from AVCHD M2TS and MKV to iTunes for my iPhone iPad? How to extract pictures from the imported video? How can I speed up the converting? Why my QuickTime player can't play the mpeg files? Can I create personalized profile for further usage? On one of my video I am trying to convert, when I load it into the program it turns the video upside down. When I play the video with quicktime player it plays fine. Any ideas on what is going on and how to fix this? I downloaded the latest version of WinX HD Video Converter for Mac, but it can not run on Mac OS 10.5. How to deal with this problem? WinX HD Video Converter for Mac is the professional HD video conversion software which supports converting Multi-track MKV M2TS HD videos, Blu-ray videos and HD camcorder videos to MOV, MP4, MPEG, FLV, AVI, iPhone, iPad, iPod, PSP, etc. WinX HD Video Converter for Mac is an all-round video converting software which could help users convert nearly all website videos, e.g. Youtube, HD Youtube, Dailymotion, Yahoo! Video, Metacafe, Myspace, etc. To convert these videos, you just need to add the url of target video by clicking "YouTube" button, and then do as convert the general videos. Yes. Built in 210+ different A/V codecs, WinX HD Video Converter for Mac can not only convert H.264, MP4, MPEG, OGG, FLV, SWF, YouTube video to iPhone/iPhone4/iPhone 3GS/iPhone 3G/iPad, but convert popular video AVI, MPG, Divx, Xvid, VOB, RM, RMVB, ASF, WMV, WTV to iTunes, iPhone, iPad compatible MP4 H264 video. In additon, it is a smart HD AVCHD M2TS and MKV to iPhone iPad video converter which can easily convert 1080P and 720P AVCHD M2TS video file to iPhone iPad compatible MP4 H.264 videos. Yes, you can. WinX HD Video Converter for Mac can make converted video display with proper file name on iPhone/iPad/iPod/Apple TV/PSP. To do this, please edit "Display Name" and "Artist Name" in the "File Setting" area. Yes. WinX HD Video Converter for Mac is continuously updated to support the new video formats in the market. Google TV is a new experience made for television that combines the TV. We have optimized our video converter to support converting GoogleTV WebM (Vpx8) to MP4, H.264, iPhone, iPad and iTunes. If you'd like to convert a segment of the HD video, you can trim the clips by dragging the left or right slider bar under the preview windows or by choosing the "Start Time" and "End Time" in the Output Setting area. Finally, do as converting general videos. Import the video file or type the YouTube video URL, and select "to Music" button. You will be able to extract the background music as MP3 music file. The output video quality is decided by many factors, say, original video, output format, frame rate and so on. 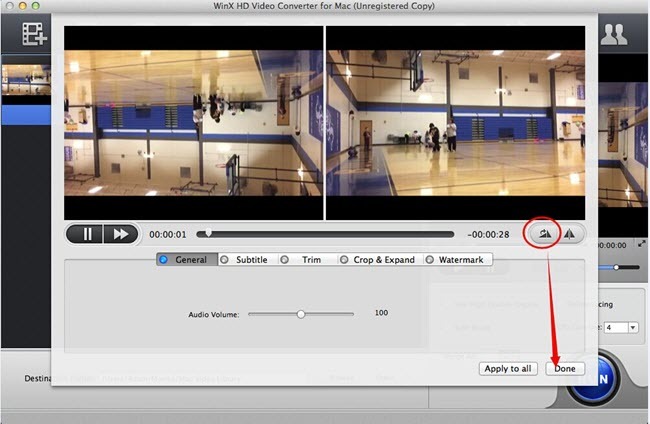 There are some ways to improve the converted quality with WinX HD Video Converter for Mac. 1. Change the output format to "MP4". 2. Please select "Use High Quality Engine" option. 3. Raise "kbps" in "Video Quality" setting area. 4. Choose "Deinterlacing" for converting interlaced scanning movie/video to progressive scanning video. Yes, it is possible. WinX HD Video Converter for Mac is capable of fixing incorrect data automatically while converting. Meanwhile, this program makes it possible to convert even corrupted video files for smoothly playback on PC. 1. The length and size of the original video file. 2. Please set the "CPU Core Use" in "Advanced Setting" area. WinX HD Video Convert for Mac supports up to 8 CPU Core which dramatically improves the video converting speed. Please choose "Safe Mode" in the interface to have a try. WinX HD Video Converter for Mac will rebuild the Audio and Video play time stamp to force it synchrony. This feature is useful even if your original video’s audio failed to sync with movie. Reinstall it to non-system partition, like D:\, E:\ ..., if you have other partitions. And please close other programs when converting. PS, Please download the latest version form here. 1. Choose other output formats for your video. 2. Use other video files to have a try. QuickTime cannot play the mpeg files, because it does not have an MPEG-2 decoder unless you buy it. For more information, please visit the QuickTime introduction. Please click "Option" button on the upper navigation bar and select "Profile Setting". You can create personalized profile for devices by editing the video/audio parameters. Then change the "Profile Name" and click "Add". Finally, click "OK" to save the setting and quit. After that, when you convert video for the specific device, you can find your personalized profile by clicking "Profile Setting" drop-down menu. Since we've updated the kernel of WinX HD Video Converter for Mac in the latest version, it can not run on Mac OS 10.5. But in order to meet Mac OS 10.5 users' needs of converting videos, we still provide the older version. Download the version for Mac OS X 10.5.